The Beni M'guild region in the western Middle Atlas of Morocco can be quite harsh in the winters months, so their rugs are very thick in pile to protect them against the cold. 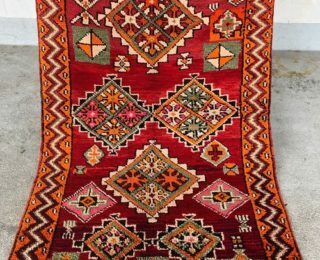 Woven by the women on a vertical loom they tend to have simple geometric designs running down or across the carpet with a background of red, brown, white or sometimes blue. Beni Mguild Rugs feature a well-known composition of diamonds in the characteristic purple-red-orange color palette with indigo accents. These rugs are all individually crafted and may be slightly asymmetrical in their shape and pattern with some minor imperfections. Place of Origin: Handcrafted in Morocco Material: 100% Wool Dimensions: 8'7" x 5'9"
The minimalist and abstract images are expressions of the natural environment and translate the joy, fear and aspirations of the weaver. 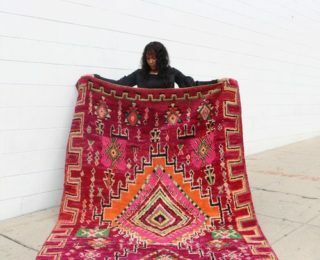 These rugs are all individually crafted and are more colorful. 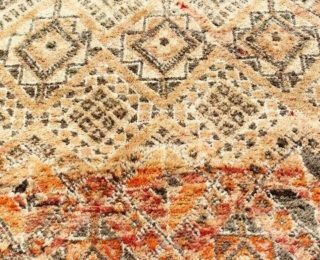 Moroccan rugs may be slightly asymmetrical in their shape and pattern with some minor imperfections. 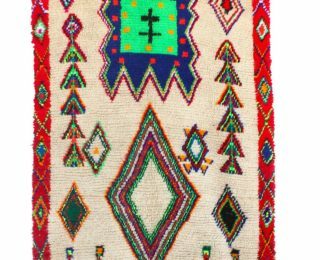 Place of Origin: Handcrafted in Morocco Material: Wool Color: Cream , Red, Green and Yellow Dimensions: 8'2" x 3'5" Detail: Rug pad recommended. Professionally clean. The minimalist and abstract images are expressions of the natural environment and translate the joy, fear and aspirations of the weaver. These rugs are all individually crafted and may be slightly asymmetrical in their shape and pattern with some minor imperfections. 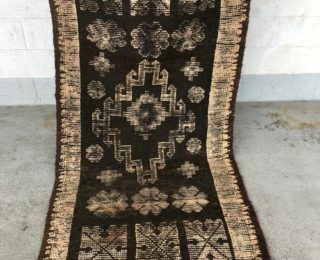 Place of Origin: Handcrafted in Morocco Material: Wool Color: Cream, Black, Pink, Green and Yellow Dimensions: 8'1" x 3'8"
Amelia- Meaning beautiful and the name fits this handmade vintage Boujaad perfectly. I hand select each piece during my sourcing trips and I find pieces that reminds me of a feeling or a place. 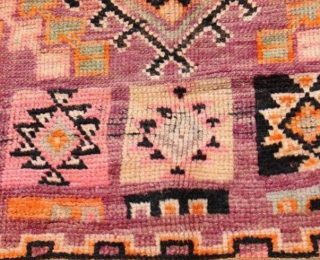 This unique piece showcases the artistic and creative side of Moroccan weavers. The color tones fade from a deep wine color to a burgundy throughout this thick and plush Boujaad rug. Atlas- Each piece that I hand select during my sourcing trips reminds me of a feeling or a place. 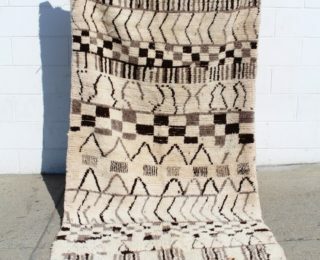 This low pile vintage boujaad piece reminded me of traveling through the Atlas mountains of Morocco. The color tones in this rug are a mix between dark browns and black reminding me how the mountains change through each region. BARAKAH- In Arabic means blessing, increase and growth. So, with each piece that I hand select during my sourcing trips I see it as being a blessing and that this piece may fit perfectly into your home. ABOUT MOROCCAN RUGS: Moroccan rugs are hand woven by Berber women of the tribal region specified. Each rug can take a few months to year to complete. The weaving techniques have been passed down through the generations. From modern designs to vintage abstract form this is a way the Berber women carefully preserve their heritage of technique and knowledge passing down messages in wool from one generation to another creating textiles full of life and charm. Please note that computer resolutions are different and we try to capture our rugs in natural light. If you would like more photos we would be happy to send just shoot us an email at Hello@soukandsoul.com Place of Origin: Handcrafted in Morocco Region: Taznakht in the High Atlas Mountains, handmade by the tribes of the Ait Ouaouzguite region. These rugs are know for their high quality silky wool, their traditional designs and their striking colors. 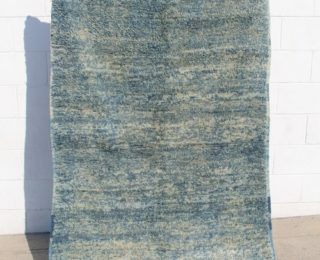 T Material: Wool Dimensions: 6’8” x 3'10" Colors: Blue and Cream PILE/CONDITION: Medium pile Detail: Rug pad recommended and Professionally clean. Fazluna- Meaning a flower in the desert. Oh how I love being in the desert. Each piece that I hand select during my sourcing trips reminds me of a feeling or a place. This piece reminded me of the warmth of the desert. The color tones change are a warm red and Burgundy undertones. Hadiya- Each piece that I hand select during my sourcing trips it reminds me just how creative and talented each of the artisans truly are. 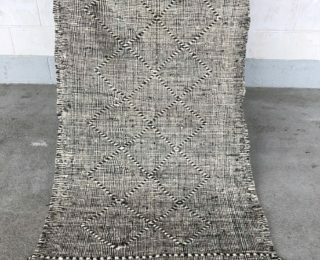 This handmade contemporary flatweave piece will fit perfect in a living room, dining room or pretty much anywhere in the house. Imsaal- Meaning Unique, one of a kind and that is what makes each Moroccan piece special. With the uniqueness of each piece that I hand select during my sourcing trips it reminds me just how creative and talented each of the artisans truly are. This vintage piece name fits as it is truly one of a kind and will fit perfect in a living room, dining room or pretty much anywhere in the house. The woman who made this pieces has weaved woman figures and other knotted symbols of protection (evil eye) throughout this perfectly faded red piece. ABOUT MOROCCAN RUGS: Moroccan rugs are hand woven by Berber women of the tribal region specified. 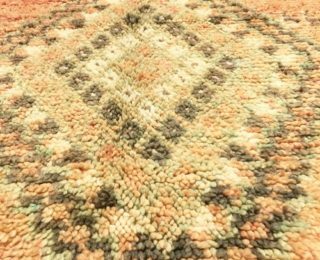 Each rug can take a few months to year to complete. The weaving techniques have been passed down through the generations. 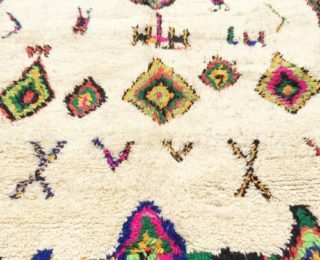 From modern designs to vintage abstract form this is a way the Berber women carefully preserve their heritage of technique and knowledge passing down messages in wool from one generation to another creating textiles full of life and charm. Please note that computer resolutions are different and we try to capture our rugs in natural light. 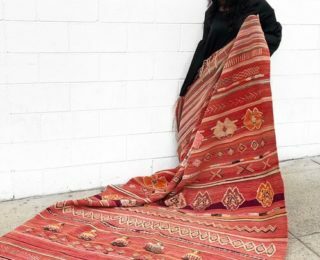 If you would like more photos we would be happy to send just shoot us an email at Hello@soukandsoul.com Place of Origin: Handcrafted in Morocco Material: Handwoven and handknotted wool. Dimensions: 8'4" x 5'2" Colors: Shades of red and pink with some purple tones, faded orange, black and cream details.